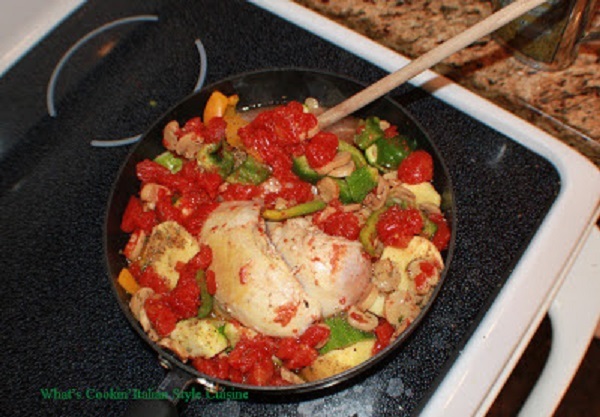 A wonderful blend of Italian seasonings, chicken and vegetables make this a Mediterranean Style Chicken Stew. Also can be put into the slow cooker with all the same ingredients on low for 8 hours. A great inexpensive meal to feed a crowd. In a large fry pan or dutch oven, saute boneless chicken breasts in 3 tablespoon olive oil around 3 minutes on each side. Add the pepper, celery, mushrooms and garlic. Continue to saute for 4 more minutes. Add the tomatoes with juice, seasonings, wine. Cook covered around 15 minutes stirring to blend. Add the diced zucchini. Simmer until the chicken is tender around 35 to 45 more minutes or until the chicken is completely cooked all through. If using a slow cooker dump everything in after chicken is sauteed and cook on low up to 8 hours or high 4 to 6 hours. Serve over a bed of white cooked rice or any kind of pasta. Delicious Claudia! A great recipe. I wish you a great 2013 full of wonderful recipes. Bacioni! Excellent recipe. Going to try this one. I have been saying I need some slow cooker recipes. This looks very delicious, Claudia. Another delicious looking dish!! lovely!